It's already the last day of LOTRO's ninth anniversary event! 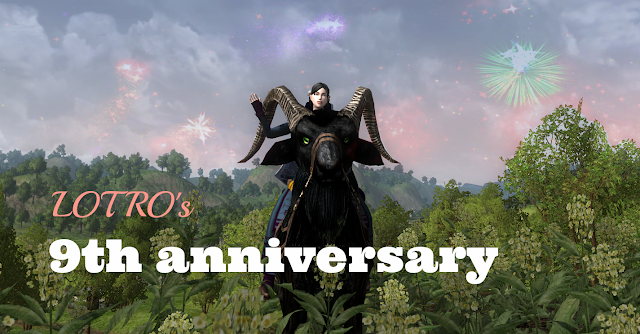 Today is the day to log all your alts and spend their anniversary tokens. Maybe you want to get some extra for that one really cool thing. In that case I have a post up with fast ways to gather anniversary tokens that might be of use to you. Today is also a good moment to spend your steel tokens: you know, the ones that occasionally drop from mobs of all levels around the world - but only during the event. I have some tips for how to spend them. The most obvious way to spend your tokens, is to visit one of the Keeper of Gifts NPCs. For instance Angeline Greenpasture at the festival area near the Bree Boar fountain (30.2S, 50.9W). As you can see, she has a variety of boxes to barter for. If your character is level 20 or higher, you can consider travelling to the Ettenmoors to barter your steel tokens for this cheaper Platinum Gift Box. Don't worry, you don't need any PvP gear for this, because you won't be fighting. Simply go to the South Bree stable-master and take a swift travel horse to the Ettenmoors. Or use your map to Glan Vraîg if you've been to the Moors before. Once you have arrived, look for Anhebron, Keeper of Gifts. He's standing next to the ranger Uirnen at 20.9S, 13.6W. Which box should I get? The Platinum Gift Boxes are a bit of a high risk, high reward kind of thing. Because they are so cheap, they're almost always worth it, though. Imagine spending 100 steel tokens. You could spend them on 4 Legendary Gift Boxes, but you could also spend them on 20(!) Platinum Gift Boxes instead, of which each has a chance to drop the content of a Legendary Gift Box. Although you don't know exactly what you'll be getting, you are guaranteed to get a lot more items in total. For people who are after Ettenmoors armour sets (even if just for cosmetic purposes), the Platinum Gift Boxes have the unique chance of dropping the highly sought after commendations (PvP currency). 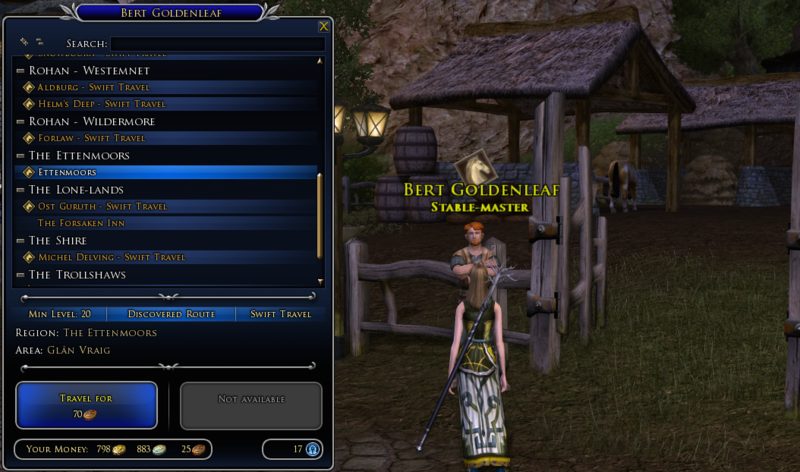 If your character is able to travel to the Ettenmoors, I would recommend getting the Platinum Gift Boxes, unless you're only after one specific item. If you have no use for the cosmetic items and pots that they drop, you can get a decent amount of money by selling them: the cosmetic items on the auction house; the pots go for several hundreds of silver at a vendor (they generally don't sell on the auction house unless they are of the highest tier). Oy, now I need more bag space (again). I know the feeling. The quest chain for tidy bags never ends!